When I talked to Sandra and Melissa, founders of New Women Space, we joked that Two Create should start a classifieds section. It could be a way for creative partners to find one another. "Friends of mine who are business owners who don’t have partners have said if they could do it again, they would do it with a partner," Sandra said. But it can be difficult to find that special person. Often, the creative partners we talk with don't know of anyone else who has a relationship quite like theirs. In this case, Melissa did have a recommendation: she told me I should talk with Shannon and Katie, two entrepreneurs supporting each other in launching their brands. "Shannon and I have been building our respective businesses alongside of each other for a while now," Katie told me over email. "We talk all the time—we bounce ideas off each other, have 'biz b' meetings, and generally support each other in any way we can." Katie (based in NYC) is the creator of House Dress, clothing "made by women, for women who dress for women," and Shannon (based in Philly) is the creator of Yowie, a lifestyle shop focused on curating small collections with the belief that independent design should be "accessible, affordable, and a little weird." Katie and Shannon's collaboration is different from others we've featured because each of them is working on their own project. Yet the support they get from one another makes their individual work possible. "At this point, I can’t imagine doing it without her," Shannon says. "I refer to her as my 'silent partner.'" How did your collaboration begin, and what does it look like? Katie: Shannon and I met while designing for American Eagle Outfitters. We only started to really get to know each other toward the end of our time at AE when Shannon joined our design team. We quickly discovered how similar we are. We both are both type A perfectionists, but also highly creative and motivated with entrepreneurial ambitions. Though we both felt comfortable in the corporate world and were worried about leaving it, our aspirations to have our businesses eventually inspired us to quit our nine-to-fives. We both probably work a million more hours than we used to, because of course we are still freelancing in addition to running our businesses, but it was a big deal to let go of regular paychecks and company-provided health insurance! Though we both felt comfortable in the corporate world and were worried about leaving it, our aspirations to have our businesses eventually inspired us to quit our nine-to-fives. Shannon: I remember seeing Katie at the office before we were friends and knew immediately that I wanted to know more about her, but the teams mostly kept to themselves. When I joined her team we instantly clicked and realized we share the same sense of humor and that we’re both super professional on the surface but super silly just beneath. It wasn’t until we both started working on our respective projects that I truly realized how similar we are in our core personalities. We’ve both described ourselves as Cathy cartoons (and call one another Cathy often) because we’re perfectionists, Type-A, over-thinkers but also super creative and fluid in finding inspiration. Our collaboration began when I needed a second opinion on some mood boards I was making for logo inspiration in the early stages of Yowie. I always admired Katie’s style from afar and thought she’d be a perfect person to ask for advice and she was! When she began to work on House Dress, I was happy to return the favor! We instantly clicked and realized that we’re both super professional on the surface but super silly just beneath. Katie: Shannon and I are in constant contact. We probably text or email every day, and if it's not direct contact, it's tagging one another in a motivating post on Instagram to remind ourselves why we are doing what we are doing, to keep hustling or just not to freak out over every small setback. We also have more scheduled chats that we call our "Biz B" meetings where we air our grievances, ask for advice, give each other progress reports and talk about future goals. Shannon: I agree! We’re both one another's biggest cheerleader and there to lift one another up on low days and celebrate even the smallest victory. Now that we live in different cities the constant contact is even more important because its a little harder to meet and give each other that tight hug or toast something positive over a glass of wine. I know that I can call Katie at anytime and that she’ll be there for me and that’s so important. Our “Biz B” chats are a little more structured and we break down current challenges to work through. Working in different sectors of design (Katie in fashion and myself in home) has made us stronger because we both look at one another's challenges objectively and in a way that the other might not have seen because we’re too close to it. I think we’ve also both developed a thicker skin from giving one another honest, real time feedback. If we can’t be honest with one another then who will? 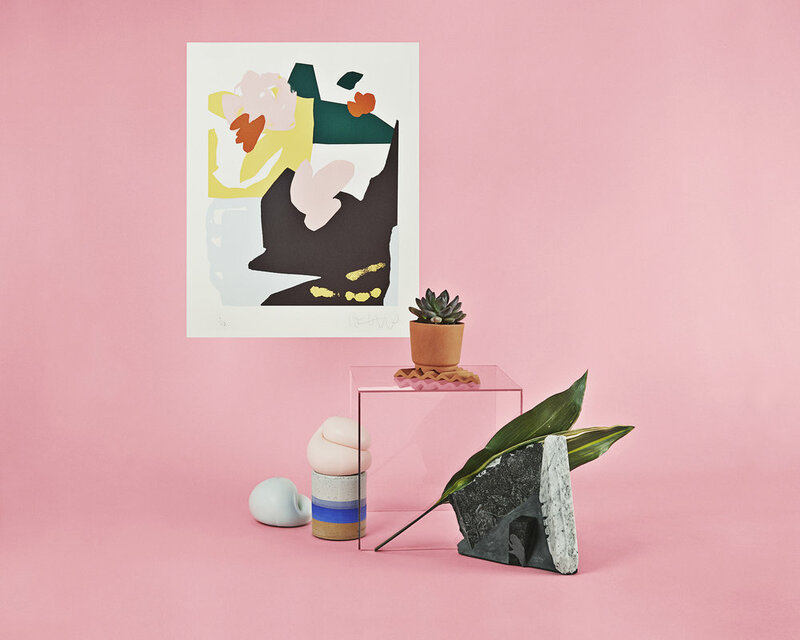 Working in different sectors of design (Katie in fashion and myself in home) has made us stronger because we both look at one another's challenges objectively and in a way that the other might not have seen. What's been the biggest impact of your collaboration on your work/art? Katie: For me it's emotional support. I know that if I am crying on the floor in a pile of fabric, I can call Shannon and she'll immediately understand. 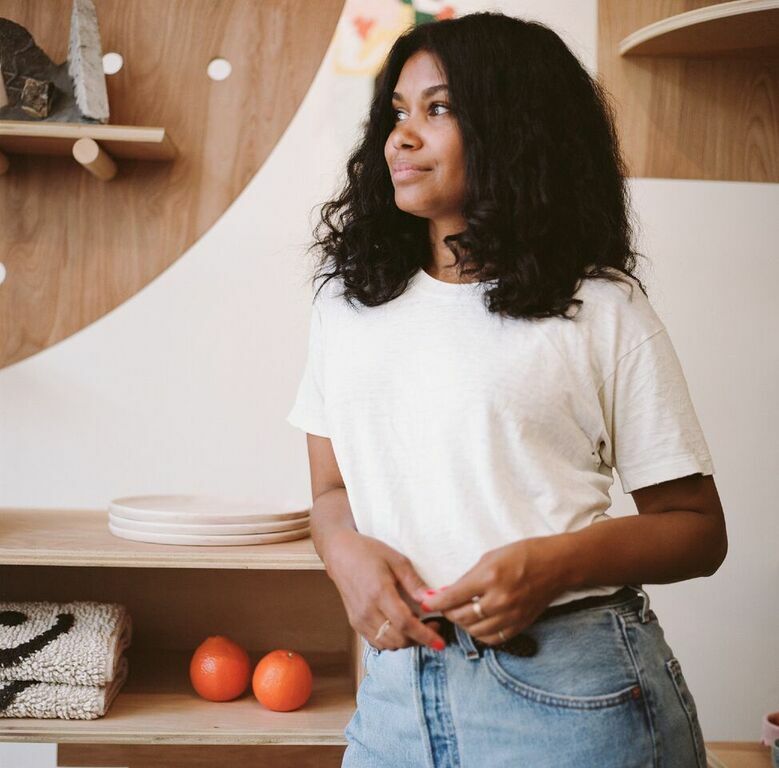 Not only is she a fashion designer by trade (so she knows how stressful the industry can be), she is aware at how personal and excruciating every decision can be when you're growing your business. I think we just keep each other going! Starting a business is so hard in so many ways and every day seems like a roller coaster emotionally. I think just having someone to bounce ideas off of, go to for advice and vent to is super important. We are kind of like peer mentors to each other. Shannon: I think the biggest impact it's had on my work is building my confidence. Throughout my design career, I have only worked for very large companies and been somewhat anonymous which made starting a brand that would be directly associated with me very scary and intimidating. Launching Yowie has brought me from behind the scenes and forced to me to accept that I have to be comfortable with being in my own skin and sometimes being the face of my brand. Katie has helped tremendously in pushing me out of my comfort zone and helping me to feel comfortable with this new, more confident version of myself. Katie: Shannon is my social media guru. I struggle with that stuff a lot so I turn to her for marketing ideas, strategies about how to keep posting and coming up with new content and just advice on this area in general. Shannon: I really admire Katie’s pragmatism when it comes to advice. One of the biggest learnings for me is being able to know when to let go and follow my gut and sometimes I get sarcastic and negative and she’s there to show me a “glass half full” kind of view. She has been an incredible sounding board and someone whose opinion I value so much. Nearly every day I have to make some kind of decision for my brand, whether it's something small such as choosing the right Instagram angle for a photo or ordering from a new designer. I know that she only wants the best for me and to see my brand grow, and I love seeing her brand grow as well in real time. At this point I can’t imagine doing it without her. I’ve referred to her as my silent partner to friends many times. At this point I can’t imagine doing it without her. I’ve referred to her as my "silent partner" to friends many times. Katie: Because I own my business by myself and take care of everything—design, production, marketing, shipping, sales, and every other little thing—it really really helps to have someone you trust in your corner who is smart, thoughtful, and is experiencing a lot of the same things you are. Though our businesses are different, we experience so many of the same challenges: difficult people, shipping nightmares, marketing faux pas. Sometimes I text Shannon about the most seemingly dull things that seem impossible to figure out in the moment, like, "SHANNON HELP I DON'T KNOW WHAT KIND OF POSTAL SCALE TO BUY!!!" And she always, always knows the right answer. Shannon: I couldn’t agree more. I often use the pronoun “we” when writing emails for my brand and people sometimes respond, “Can’t wait to meet the team!” and I laugh to myself thinking if only they knew that I am writing this email from my second bedroom that I use as my studio and that there’s a bra hanging on the door handle and that Yowie is solely me. I think deep down that the “we” is Katie and I. I do EVERYTHING pertaining to my brand, so knowing that I have a better half to help me with the emotional stuff and tough decisions is important. Our boyfriends can only be so supportive and understanding. They don’t always understand the stress of an Instagram post that doesn’t get the expected traction or a package full of handmade ceramics that the post office broke. Doing anything in a silo is not healthy—business is the same. You need to have a person in your corner you can trust. Katie: I would say that it really helps to find someone who is doing a similar thing to you, but not the exact same thing. Of course I talk to other women who have their own clothing lines for industry specific help, but I think it's great that Shannon and I have no competition and offer each other a diverse perspective. It's also great to talk with Shannon because she might have had a successful photoshoot with Yowie and an idea of how I can use that same strategy or idea with House Dress and I don't feel weird about recreating it since our aesthetics and business are really different. For example, recently I was having trouble coming up with quick Instagram photoshoot ideas and she suggested just going out to the fruit market and having a friend shopping, wearing House Dress, picking up a bunch of fruits while I photograph her. Shannon: I think social media is sometimes a gift and a curse of creating a narrative that isn’t 100% true. I’m super flattered when people I meet think that Yowie is successful because of a great photo or some new coverage the brand gets, but I am quick to tell them that we’re still so new and learning every day and that it's all an uphill climb. I think doing anything in a silo is not healthy, so business is the same. You need to have a person in your corner that you can trust, be inspired by without anyone feeling competitive or taking things personally. Having a solid foundation in your friendship is key and being able to be honest, but not blunt or tactless with one another is a good rule of thumb. We’ve had tougher conversations where don't agree with one other but we always listen, absorb, and evaluate all parts of the conversation or issue. If it's a friend with whom you cannot be honest (for whatever reason) that may not be the right creative partner for you; BUT when you find THE ONE, you’ll know and you guys will grow together! Katie Goldman Macdonald is a womenswear designer, caught between a love of minimalism and a deep urge to keep every scrap of fabric, every fallen tree branch and all the vintage kimonos. She recently launched House Dress, a women's clothing brand based on her deep love of the muumuu. Her California roots inform the effortless feel of the collection while her time in New York has inspired the modern and functional aesthetic of House Dress. House Dress is made by women, for women who dress for women. Shannon Maldonado grew up in South Philadelphia, spending the last twelve years in New York City designing for various American sportswear brands. 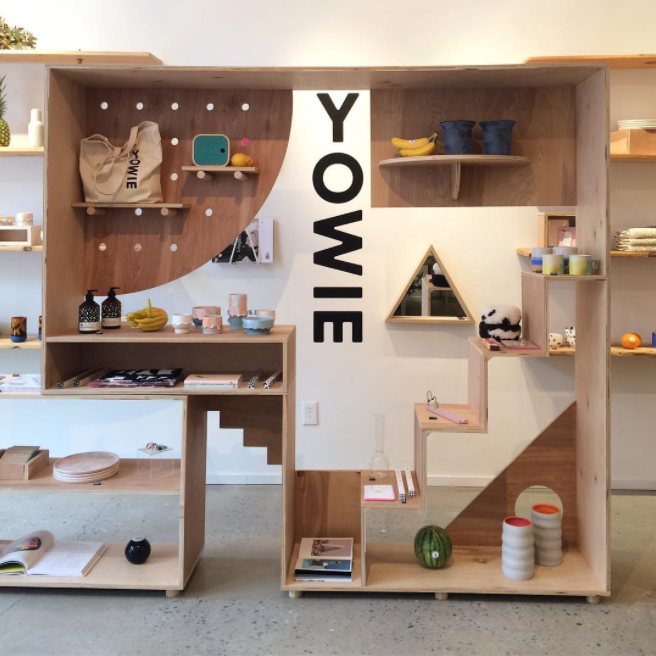 As her inspirations began to shift into curating her perfect space at home she returned to Philadelphia to launch Yowie, a lifestyle shop. She loves discovering new products, big leafy plants, Google investigations, Drake's many feelings, and anything and everything related to 80s-era Travolta.